A few things I have been cooking in recent weeks. Poached pears in all sorts of ways – not a new thing in my repertoir (poached pear trifle | poached pear chocolate tart | poached pears) but not something I’ve made in a while. Here’s some thoughts. Red or white wine is fine – but different effects. A fortnight ago I poached some pears ahead of time for a diner à deux and then accidentally left them on the kitchen counter for four days, so they were not useable. So I tried again with rosé and that was fab too. With white wine, lemongrass and ginger are great flavours; with red you can throw the whole spice rack at it, especially cloves, star anise, cardamom and cinnamon. You can also use white or dark sugar – you get a great hit from the caramellyness of muscovado. Poach the pears whole, peeled and with their bottoms cut off so they stand up on the eventual plate, or more quickly quartered or halved, depending on where they are ending up. 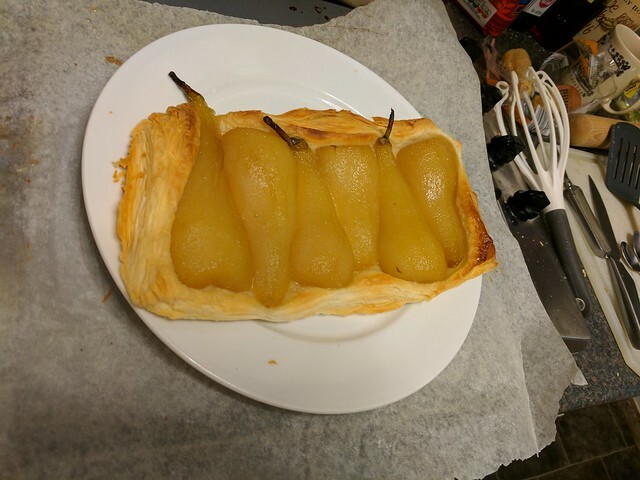 A whole pear is spectacular, but the most recent outing was intended as a topping for some leftover puff pastry, so they could be done in halves. Push a toothpick through them to test for readiness. I’m a huge fan of vanilla mascarpone as an accompaniment, but this time, inspired by Jamie Oliver, I made a walnut cream by blitzing and combining equal quantities of walnuts and mascarpone and sweetening slightly with icing sugar. One final tip – the trad thing to do at the end is boil the poaching liquor down to make a syrup to serve. If you’re doing this, there’s no need to boil ALL of the poaching liquor down. Reserve maybe a cupful (for 2) or pint (for 4-6) and boil that down for a much quicker approach. It can be tricky to boil enough or too much, so remember you can drop a teaspoonful on a cold plate to see what the consistency will be when it has cooled. I do love the Guardian’s “how to make the perfect…”series. I read Felicity Cloake’s treatise on chocolate pots in which she scampered through a range of different recipes, but in the end plumped for making something rather simpler. My version still looked sensational, but was really ever so simple. The only tricky part is the time, but it barely takes an hour for each layer to set enough for the next. It would have looked even better if I could just learn to be a neater cook and not drip chocolate all down the outside of everything. I made the ramekins for my pudding club friends and the shot glasses for my friends at work, many of whom are dieting. Same ingredients. A ganache is basically equal quantities ml for g of chocolate and double cream. Heat the cream, drop in the chocolate, stir until it melts, pour, refrigerate. Flavour if you wish with any strongly flavoured liquid, boozy or otherwise – cointreau, coffee, vanilla essence. Go for quality chocolate or a medium level supermarket own brand, but steer clear of the baking chocolate from the cake decorating aisle. 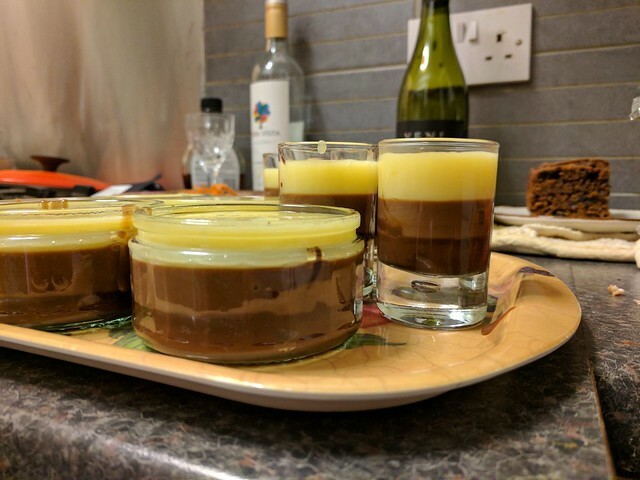 My five ramekin and four shot glasses were made from 150 grams each of dark, milk and white chocolate, unflavoured. 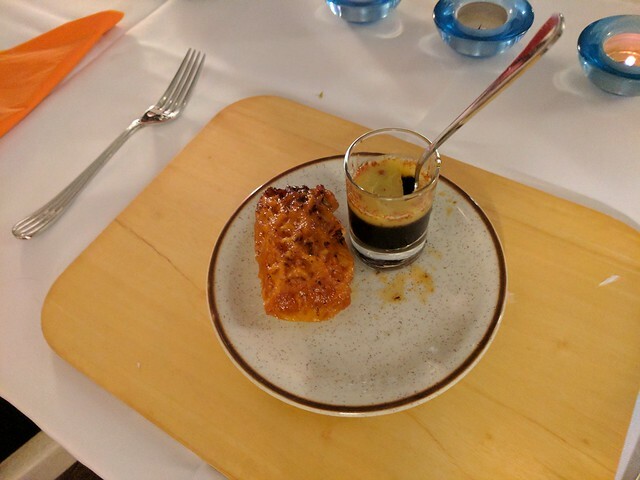 My colleagues told me a shot glass was enough; I managed a shot glass AND a ramekin in one day; my friends ate half a pot and reserved the remainder for the following day. 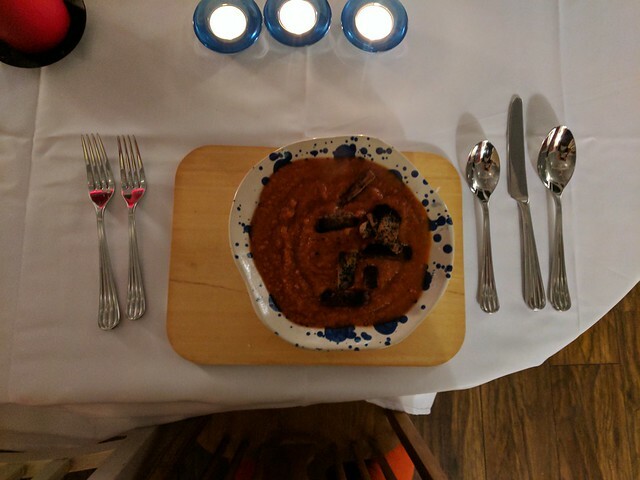 A hearty tomato and lentil soup that will also see me through the week – chopped carrots, onions, celery and garlic fired in olive oil, a spoonful of cumin and random dried herbs stirred through (I think it was oregano), veggie stock cubes and tinned and puréed tomatoes. Whenever I now use my little stick blender I think of the ones in Nisbets the size of a pneumatic drill! 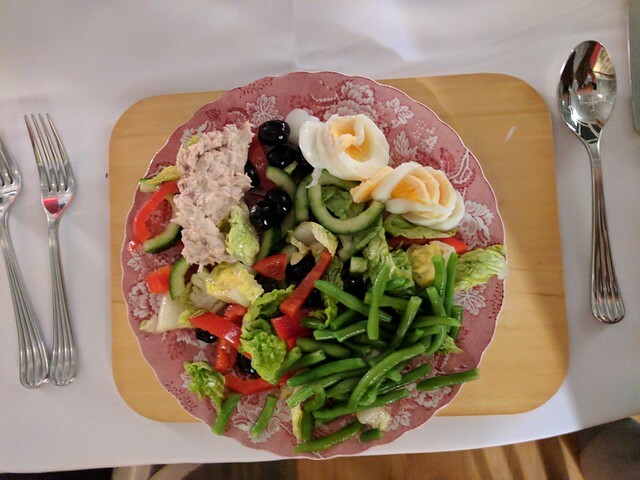 A crunchy salad of lettuce, cuke, red pepper and black olives that match my fingernails, dressed in EVOO and sherry vinegar, with toppings of green beans, hard boiled egg and tuna mayonnaise. For a dessert I had another go at Raymond Blanc’s pineapple three ways. I made this four years ago after it had just been on his TV programme. Then the recipe disappeared from the Beeb website. Now it is available again at Blanc’s own site. I don’t have the mandolin which makes the sliced / candied step too hard to do, and the roasting and basting every 15 minutes is a faff, but still delicious. 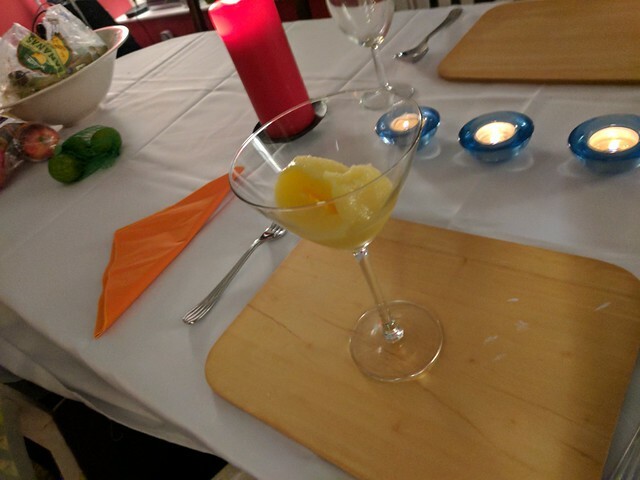 The sorbet, however, is amazing – so simple and so delicious, and vaguely even healthy! I didn’t macerate, or measure sugar too carefully, just pineapple prepped and cored into the nutribullet with the juice of a lime and a slug of sugar, the resultant foam frozen in a Chinese takeaway box. Without the benefit of churning, this then needs to come out of the freezer half an hour before serving otherwise you will be chipping away at a pineapple iceberg.